My inbox has been lighting up with questions about Confide, after it was allegedly found to have been used by staffers at the White House. I wish I had all of the free time that reporters think I have (I’d be so happy, living life as a broke beach bum). I did spend a little bit of time, however reverse engineering the binary and doing a simple forensic examination of it. Here’s my “literature in a rush” version. Note: When I first wrote this blog post, I apparently had run into some corruption or some other strangeness going on with the framework; I suspect one of the tools I normally use might have decrypted it for me, and done a shoddy job without even telling me, so I have decrypted it by hand dumping memory from a debugger, and have updated my findings accordingly. Social media is ripe with analysis of an FBI joint report on Russian malicious cyber activity, and whether or not it provides sufficient evidence to tie Russia to election hacking. What most people are missing is that the JAR was not intended as a presentation of evidence, but rather a statement about the Russian compromises, followed by a detailed scavenger hunt for administrators to identify the possibility of a compromise on their systems. The data included indicators of compromise, not the evidentiary artifacts that tie Russia to the DNC hack. One thing that’s been made clear by recent statements by James Clapper and Admiral Rogers is that they don’t know how deep inside American computing infrastructure Russia has been able to get a foothold. Rogers cited his biggest fear as the possibility of Russian interference by injection of false data into existing computer systems. Imagine the financial systems that drive the stock market, criminal databases, driver’s license databases, and other infrastructure being subject to malicious records injection (or deletion) by a nation state. The FBI is clearly scared that Russia has penetrated more systems than we know about, and has put out pages of information to help admins go on the equivalent of a bug bounty. I wasn’t originally going to dig into some of the ugly details about San Bernardino, but with FBI Director Comey’s latest actions to publicly embarrass Hillary Clinton (who I don’t support), or to possibly tip the election towards Donald Trump (who I also don’t support), I am getting to learn more about James Comey and from what I’ve learned, a pattern of pushing a private agenda seems to be emerging. This is relevant because the San Bernardino iPhone matter saw numerous accusations of pushing a private agenda by Comey as well; that it was a power grab for the bureau and an attempt to get a court precedent to force private business to backdoor encryption, while lying to the public and possibly misleading the courts under the guise of terrorism. Sir, you may not know me, but I’ve impacted your agency for the better. For several years, I have been assisting law enforcement as a private citizen, including the Federal Bureau of Investigation, since the advent of the iPhone. I designed the original forensics tools and methods that were used to access content on iPhones, which were eventually validated by NIST/NIJ and ingested by FBI for internal use into your own version of my tools. Prior to that, FBI issued a major deviation allowing my tools to be used without validation, due to the critical need to collect evidence on iPhones. They were later the foundation for virtually every commercial forensics tool to make it to market at the time. I’ve supported thousands of agencies worldwide for several years, trained our state, federal, and military in iOS forensics, assisted hands-on in numerous high-profile cases, and invested thousands of hours of continued research and development for a suite of tools I provided at no cost – for the purpose of helping to solve crimes. I’ve received letters from a former lab director at FBI’s RCFL, DOJ, NASA OIG, and other agencies citing numerous cases that my tools have been used to help solve. I’ve done what I can to serve my country, and asked for little in return. First let me say that I am glad FBI has found a way to get into Syed Farook’s iPhone 5c. Having assisted with many cases, I understand from firsthand experience what you are up against, and have enormous respect for what your agency does, as well as others like it. Often times it is that one finger that stops the entire dam from breaking. I would have been glad to assist your agency with this device, and even reached out to my contacts at FBI with a method I’ve since demonstrated in a proof-of-concept. Unfortunately, in spite of my past assistance, FBI lawyers prevented any meetings from occurring. But nonetheless, I am glad someone has been able to reach you with a viable solution. First, is interesting to note that the way the FBI categorizes this tool’s capabilities is “5c” and “9.0”; namely, hardware model and firmware version. They won’t confirm that it’s the only combination that the tool runs on, but have noted that these are the two factors they’re categorizing it by. This is consistent with how exploit-based forensics tools have functioned in the past. My own forensics tools (for older iPhones) came in different modules that were tailored for a specific hardware platform and firmware version. This is because most exploits require taking Apple’s own firmware and patching it; those patches require slightly different offsets in the kernel (and possibly boot loader). The software to patch is also going to be slightly different for each hardware and firmware combination. So without saying really anything, FBI has kind of hinted that this might be a software exploit. Had this been a hardware attack, such as a NAND mirroring technique, firmware version likely wouldn’t be a point of discussion, as the technique’s feasibility is dependent on hardware revision. This is all conjecture, of course, but is worth noting that the hints are already there. If the FBI did in fact use a software exploit, the question then becomes one of how viable it is on other platforms. Typically, a software exploit of this magnitude could very well take advantage of vulnerabilities that have long existed in the firmware, making it more than likely that the exploit may also be effective (possibly with a little tailoring) to older versions of iOS. Even if the exploit today was tailored specifically for this device, adjusting offsets and patching slightly different copies of Apple’s firmware is a relatively painless process. A number of open source tools even exist to find and patch the correct bytes in decrypted Apple kernels. This is a simple “concept” demonstration / simulation of a NAND replay attack on an iOS 9.0 device. I wanted to demonstrate how copying back disk content could allow for unlimited passcode attempts. Here, instead of using a chip programmer to copy certain contents of the NAND, I demonstrate it by copying the data using a jailbreak. For Farook’s phone, the FBI would remove the NAND chip, copy the contents into an image file, try passcodes, and then copy the original content back over onto the chip. I did this here, only with a jailbreak: I made a copy of two property lists stored on the device, then copied them back and rebooted after five attempts. When doing this on a NAND level, actual blocks of encrypted disk content would be copied back and forth, whereas I’m working with files here. The concept is the same, and serves only to demonstrate that unlimited passcode attempts can be achieved by back-copying disk content. Again, NO JAILBREAK IS NEEDED to do this to Farook’s device, as the FBI would be physically removing the NAND to copy this data. Other techniques can be used to speed this up. For example, the clock could possibly be fudged by giving the device a data connection and rerouting time requests to a local server. Think IMSI catcher. This could be used to continuously bump the time five or ten minutes so that more passcode attempts could be tried per reboot without as many delays. The NAND chip could also be socketed or reworked in other ways to make switches seamless. Lastly, the same techniques used in IP BOX such as entering pins through the usb, and using a light sensor to detect an unlock, could help to automate this to be more efficient. Overall, I think this puts to bed any notion that the technique “doesn’t work”. Gary Fagan, the Chief Deputy District Attorney for San Bernardino County, filed an amicus brief to the court in defense of the FBI compelling Apple to backdoor Farook’s iPhone. In this brief, DA Michael Ramos made the outrageous statement that Farook’s phone might contain a “lying dormant cyber pathogen”, a term that doesn’t actually exist in computer science, let alone in information security. CIS sought to file a friend-of-the-court, or “amici curiae,” brief in the case today. We submitted the brief on behalf of a group of experts in iPhone security and applied cryptography: Dino Dai Zovi, Charlie Miller, Bruce Schneier, Prof. Hovav Shacham, Prof. Dan Wallach, Jonathan Zdziarski, and our colleague in CIS’s Crypto Policy Project, Prof. Dan Boneh. CIS is grateful to them for offering up their expert take on the serious implications of the court’s order for the entire security ecosystem. We hope the court will listen. Many sat before Congress yesterday and made their cases for and against a backdoor into the iPhone. Little was said, however, of the mistakes that led us here before Congress in the first place, and many inaccurate statements went unchallenged. The most notable mistake the media has caught onto has been the blunder of changing the iCloud password on Farook’s account, and Comey acknowledged this mistake before Congress. You know the old saying, “shoot first, ask questions later”. It refers to the notion that careless law enforcement officers can often be short sighted in solving the problem at hand. It’s impossible to ask questions to a dead person, and if you need answers, that really makes it hard for you if you’ve just shot them. They’ve just blown their only chance of questioning the suspect by failing to take their training and good judgment into account. This same scenario applies to digital evidence. Many law enforcement agencies do not know how to properly handle digital evidence, and end up making mistakes that cause them to effectively kill their one shot of getting the answers they need. In the case involving Farook’s iPhone, two things went wrong that could have resulted in evidence being lifted off the device. First, changing the iCloud password prevented the device from being able to push an iCloud backup. As Apple’s engineers were walking FBI through the process of getting the device to start sending data again, it became apparent that the password had been changed (suggesting they may have even seen the device try to authorize on iCloud). If the backup had succeeded, there would be very little, if anything, that could have been gotten off the phone that wouldn’t be in the iCloud backup. Recent speculation has been made about a plan to unlock Farook’s iPhone simply so that they can walk through the evidence right on the device, rather than to forensically image the device, which would provide no information beyond what is already in an iCloud backup. Going through the applications by hand on an iPhone is along the dumpster level of forensic science, and let me explain why. The device in question appears to have been powered down already, which has frozen the crypto as well as a number of processes on the device. While in this state, the data is inaccessible – but at least it’s in suspended animation. At the moment, the device is incapable of connecting to a WiFi network, running background tasks, or giving third party applications access to their own data for housekeeping. This all changes once the device is unlocked. Now when a pin code is brute forced, the task is actually running from a separate copy of the operating system booted into memory. This creates a sterile environment where the tasks on the device itself don’t start, but allows a platform to break into the device. This is how my own forensics tools used to work on the iPhone, as well as some commercial solutions that later followed my design. The device can be safely brute forced without putting data at risk. Using the phone is a different story. 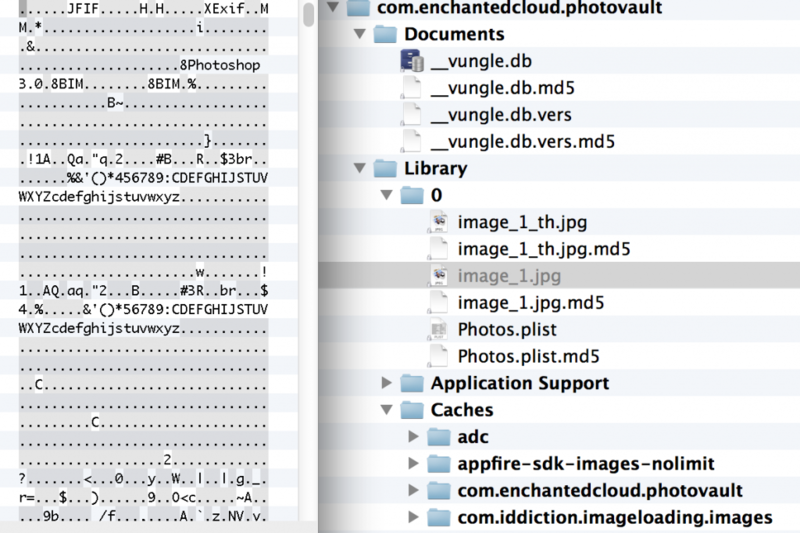 Here’s iOS file system / PIN encryption as I understand it. I originally pastebin’d this but folks thought it was worth keeping around. (Thanks to Andrey Belenko for his suggestions for edits). Block 0 of the NAND is used as effaceable storage and a series of encryption “lockers” are stored on it. This is the portion that gets wiped when a device is erased, as this is the base of the key hierarchy. These lockers are encrypted with a hardware key that is derived from a unique hardware id fused into the secure space of the chip (secure enclave, on A7 and newer chipsets). Only the hardware AES routines have access to this key, and there is no known way to extract it without chip deconstruction. One locker, named EMF!, stores the encryption key that makes the file system itself readable (that is, directory and file structure, but not the actual content). This key is entirely hardware dependent and is not entangled with the user passcode at all. Without the passcode, the directory and file structure is readable, including file sizes, timestamps, and so on. The only thing not included, as I said. Is the file content. There’s another locker in the NAND (what Apple calls the class 4 key, and what we call the DKEY). The DKEY is not encrypted with the user PIN, and in previous versions of iOS (<8), was used as the foundation for encryption of any files that were not specifically protected with “data protection”. Most of the file system at the time used the Dkey instead of a class key, by design. Because the PIN wasn’t involved in the crypto (like it is with the class keys in the keybag), anyone with root level access (such as Apple) could easily open that Dkey locker, and therefore decrypt the vast majority of the file system that used it for encryption. The only files that were protected with the PIN up until iOS 8 were those with data protection explicitly enabled, which did not include a majority of Apple’s files storing personal data. In iOS 8, Apple finally pulled the rest of the file system out of the Dkey locker and now virtually the entire file system is using class keys from the keybag that *are* protected with the user’s PIN. The hardware-accelerated AES crypto functions allow for very fast encryption and decryption of the entire hard disk making this technologically possible since the 3GS, however for no valid reason whatsoever (other than design decisions), Apple decided not to properly encrypt the file system until iOS 8. I’m still reading the specs on DIME, but already it’s leaving a bad taste in my mouth. It feels like it’s more or less trying to band-aid an already broken anonymous mail system, that really isn’t anonymous at all, and leaves far too much metadata lying around. Even with DIME, it looks like too much information is still exposed to be NSA proof (like sender and recipient domain names), and with all of the new moving parts, it leaves a rather large attack surface. It feels more as if DIME gives you plausible deniability, but not necessarily NSA proof anonymity, especially in light of TAO, and the likelihood at least one end of the conversation will be compromised or compelled by FISA. I could be wrong, but it at least got me thinking about what my idea of an Internet dark mail system would look like. Let me throw this idea out there for you. We all want to be able to just write an email, then throw it anonymously into some large vortex where it will magically and anonymously end up in the recipient’s hands, right? What’s preventing that from being a reality? Well, a few things. One of the most popular App Store applications, Private Photo Vault (Ultimate Photo+Video Manager) claims over 3 million users, and that your photos are “100% private”. The application, however, stores its data files without using any additional protection or encryption than any other files stored on the iPhone. With access to an unlocked device, a pair record from a seized desktop machine, or possibly even just a copy of a desktop or iCloud backup, all of the user’s stored images and video can be recovered and read in cleartext. As it turns out, the same mechanism that provided iOS 7 with a potential back door can also be used to help secure your iOS 7 or 8 devices should it ever fall into the wrong hands. This article is a brief how-to on using Apple’s Configurator utility to lock your device down so that no other devices can pair with it, even if you leave your device unlocked, or are compelled into unlocking it yourself with a passcode or a fingerprint. By pair-locking your device, you’re effectively disabling every logical forensics tool on the market by preventing it from talking to your iOS device, at least without first being able to undo this lock with pairing records from your desktop machine. This is a great technique for protecting your device from nosy coworkers, or cops in some states that have started grabbing your call history at traffic stops. With iOS 8’s new encryption changes, Apple will no longer service law enforcement warrants, meaning these forensics techniques are one of just a few reliable ways to dump forensic data from your device (which often contains deleted records and much more than you see on the screen). Whatever the reason, pair locking will likely leave the person dumbfounded as to why their program doesn’t work, and you can easily just play dumb while trying not to snicker. This is an important step if you are a journalists, diplomat, security researcher, or other type of individual that may be targeted by a hostile foreign government. It also helps protect you legally, so that you don’t have to be put in contempt of court for refusing to turn over your PIN. The best thing about this technique is, unlike my previous technique using pairlock, this one doesn’t require jailbreaking your phone. You can do it right now with that shiny new device. There’s been a lot of confusion about Apple’s recent statements in protecting iOS 8 data, supposedly stifling law enforcement’s ability to do their job. FBI boss James Comey has publicly criticized Apple, and essentially blamed them for the next hundred children who get kidnapped. While Apple’s new security improvements have made it a lot harder to get to certain types of data, it’s important to note that there are still a number of techniques that can be employed against iOS 8, with varying levels of success. Most of these are techniques that law enforcement is already doing. Some are part of commercial forensics tools such as Oxygen and Cellebrite. The FBI is undoubtedly aware of them. I’ll outline some of the most common ones here. I’ve included some tips for those of us who are concerned about data security. Security researchers, journalists, law abiding activists, diplomats, and many other types of high profile individuals should all be practicing good data security, especially when abroad. Foreign governments are just as capable of performing the same forensics techniques that our own government is capable of, and there is an overwhelming amount of information suggesting that all of these classes of individuals have been targeted by foreign governments. Apple’s new policy about law enforcement is ruffling some feathers with FBI, and has been a point of debate among the rest of us. It has become such because it’s been viewed as just that – a policy – rather than what it really is, which is a design change. With iOS 8, Apple has finally brought their operating system up to what most experts would consider “acceptable security”. My tone here suggests that I’m saying all prior versions of iOS had substandard security – that’s exactly what I’m saying. I’ve been hacking on the phone since they first came out in 2007. Since the iPhone first came out, Apple’s data security has had a dismal track record. Even as recent as iOS 7, Apple’s file system left almost all user data inadequately encrypted (or protected), and often riddled with holes – or even services that dished up your data to anyone who knew how to ask. Today, what you see happening with iOS 8 is a major improvement in security, by employing proper encryption to protect data at rest. Encryption, unlike people, knows no politics. It knows no policy. It doesn’t care if you’re law enforcement, or a criminal. Encryption, when implemented properly, is indiscriminate about who it’s protecting your data from. It just protects it. That is key to security. Up until iOS 8, Apple’s encryption didn’t adequately protect users because it wasn’t designed properly (in my expert opinion). Apple relied, instead, on the operating system to protect user data, and that allowed law enforcement to force Apple to dump what amounted to almost all of the user data from any device – because it was technically feasible, and there was nobody to stop them from doing it. From iOS 7 and back, the user data stored on the iPhone was not encrypted with a key that was derived from the user’s passcode. Instead, it was protected with a key derived from the device’s hardware… which is as good as having no key at all. Once you booted up any device running iOS 7 or older, much of that user data could be immediately decrypted in memory, allowing Apple to dump it and provide a tidy disk image to the police. Incidentally, it also allowed a number of hackers (including criminals) to read it.